Using VanDyke Brown, I begin laying in soft washes in the water and in the background (only where the painting is bone-dry). Noticed how the softened edges, in horizontal bands begin to define the water. The horizontal bands are very important. 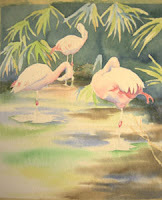 If you don’t keep your main brushwork on the water primarily horizontal, your water will not read as flat. 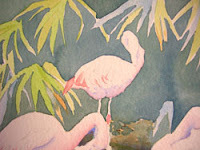 In this detail, you can see how the VanDyke Brown is touched in with a number 6 round brush near the legs of the smallest flamingo.